Who would like to walk through the forest full of Puyas Raimondi? What attractions do we choose while travelling? What or who do we follow when choosing the places we are going to visit? Personally, I always try to travel to the places I will definitely not be able to see in my country or in other parts of the world. I am looking for anything that is original, unique. How about you? How do you plan your holiday? Either in Peru or in Bolivia I recommend you taking a walk through a forest full of giant bromeliads! There is no chance you will experience this in other countries! Puya raimondi is the largest plant of bromeliad species, reaching up to several meters. It can be found only at the heights from about 3200 to about 4800 masl, only in the Peruvian or Bolivian Andes. Unfortunately, it is currently a species endangered by extinction. It is estimated that there are only around 800,000 Puyas Raimondi can be found throughout Peru and about 30,000-35,000 in Bolivia. The plant was first discovered in 1830 by the French scientist Alcide d’Orbigny in the Vacas region of Bolivia. In Peru, it was Antonio Raimondi, the Italian naturalist, who first came across this plant in the area of Chavin. He was also the first to label her as Pourretia gigantea in 1874. In 1928, the German botanist Hermann Harms set up her current name, Puya Raimondi. What makes the plant so special apart from its gigantic size? It blooms only once in a lifetime. After this, it dies. However, before blossoming it can live from 40 to even 100 years. Where in Peru can you walk around these giants? For those who are planning to travel to north of Lima I recommend visiting Huascaran National Park. You will certainly come across Puya Raimondi! 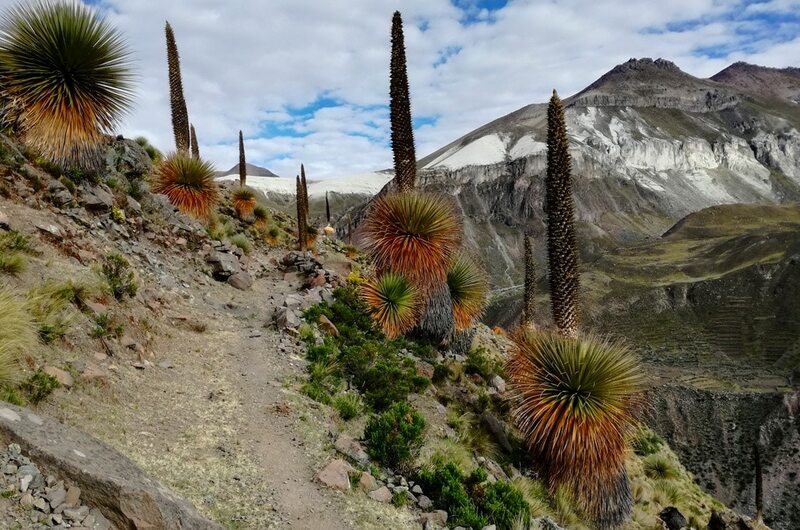 Those who have time only for visiting the southern part of the country, you can still encounter this plant in the Cotahuasi Canyon and in the region of Puno or Ayacucho. Where in Bolivia can you meet Puya Raimondi? In Bolivia, you can easily admire this plant in the regions of Vacas, Cochabamba, and Comanche. Who would like to walk through the forest full of Puyas Raimondi? We definitely recommend it! It is worth seeing what is unique and not present anywhere else in the world!